Elaine holds an RHS Silver Gilt medal and received the Talas Award at 16th Annual International ASBA Exhibition at The Horticultural Society of New York. Her work is included in The Highgrove Florilegium and The Hunt Institute of Botanical Documentation and has also been selected for inclusion in the Transylvania Florilegium presently being created under the umbrella of the Prince's School of Traditional Arts to record in a permanent way the flora of Transylvania. 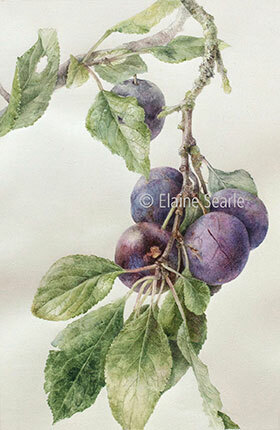 Her painting on vellum of heritage plum ‘Kirkes Blue’ was exhibited at the Garden Museum, London in 2017. Working on paper and vellum, often to commission, she finds inspiration in a very wide range of subjects. Her watercolours are known for their subtlety, focus on spacial depth and striking composition. 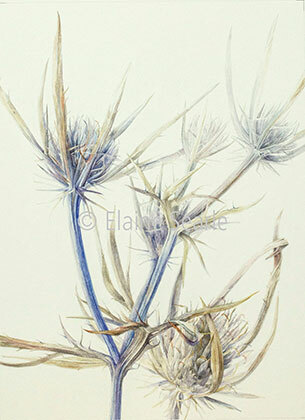 She travels widely in Europe and the USA to teach workshops and botanical painting holidays. Elaine also oﬀers distance learning via a range of short online courses. Details and further examples of her work may be found at her website www.paintbotanical.com.